Italy's Civil Protection agency said the last person to have been found dead was a surfer in the Adriatic sea town of Cattolica. The agency on Tuesday declared the highest level of alert on several regions, mainly in the north, where storms were expected to continue all day. 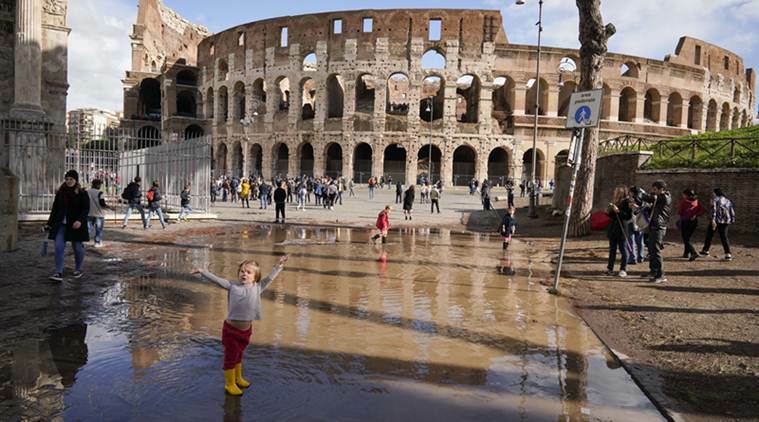 Rome: Nine people have been killed in Italy as violent storms batter the country for a third day, with several regions on high alert. The breakwater walls in the chic seaside resort of Rapallo, in northeast Italy, were destroyed by fierce winds overnight, allowing in a surge of water that toppled yachts over and inflicted heavy damage on the port area. “The exceptional wave of bad weather leaves us with a dramatic toll: nine dead, four serious injuries and one person missing,” said Interior Minister Matteo Salvini. Italy’s Civil Protection agency said the last person to have been found dead was a surfer in the Adriatic sea town of Cattolica. The agency on Tuesday declared the highest level of alert on several regions, mainly in the north, where storms were expected to continue all day. An orange alert, the second highest on the scale, was issued for the central regions of Abruzzo and Lazio – which includes the capital Rome – where gale-force winds topped 100 kph on Monday. Authorities in the lagoon city of Venice had barred access on Monday to the central St Mark’s Square, which was heavily flooded. The national fire brigade said it had intervened in 7,000 cases across the country and that one of its staff had died, crushed by a tree during a rescue operation in a small town in South Tyrol. The weather was expected to improve from the late afternoon, “giving the country a truce” an official from the civil protection agency told Reuters. Meanwhile, heavy snowfall across south-central France, with up to 40 cm (16 inches) falling in some towns and villages, has caused chaos on the roads and knocked out electricity to nearly 200,000 homes, authorities said on Tuesday.